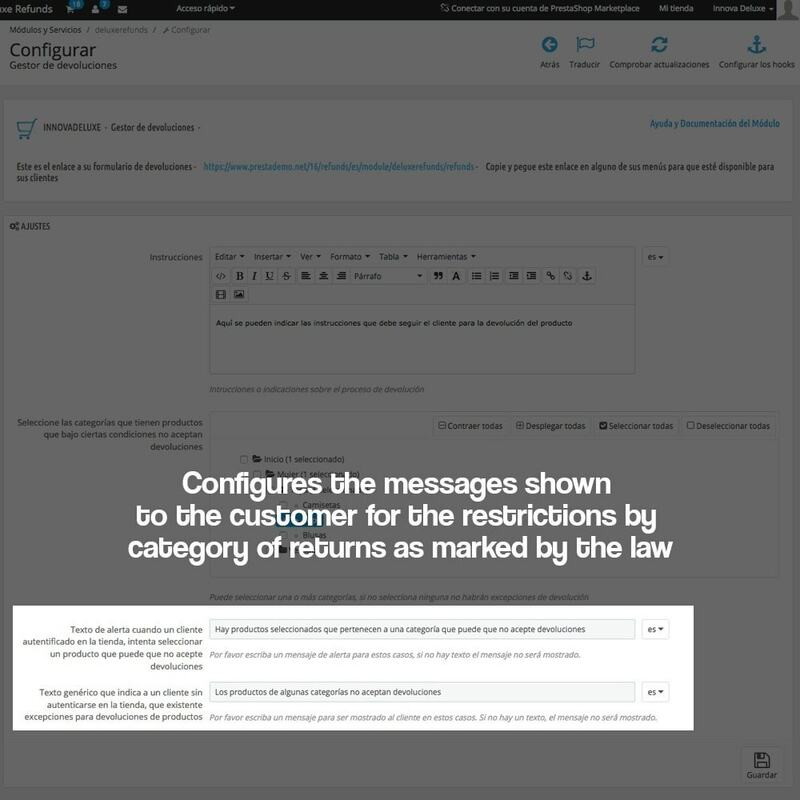 Module guaranteeing that your store is accomplishing with customer right of withdrawal (refunds). This module is accomplishing with the consumers defense law about product refunds. 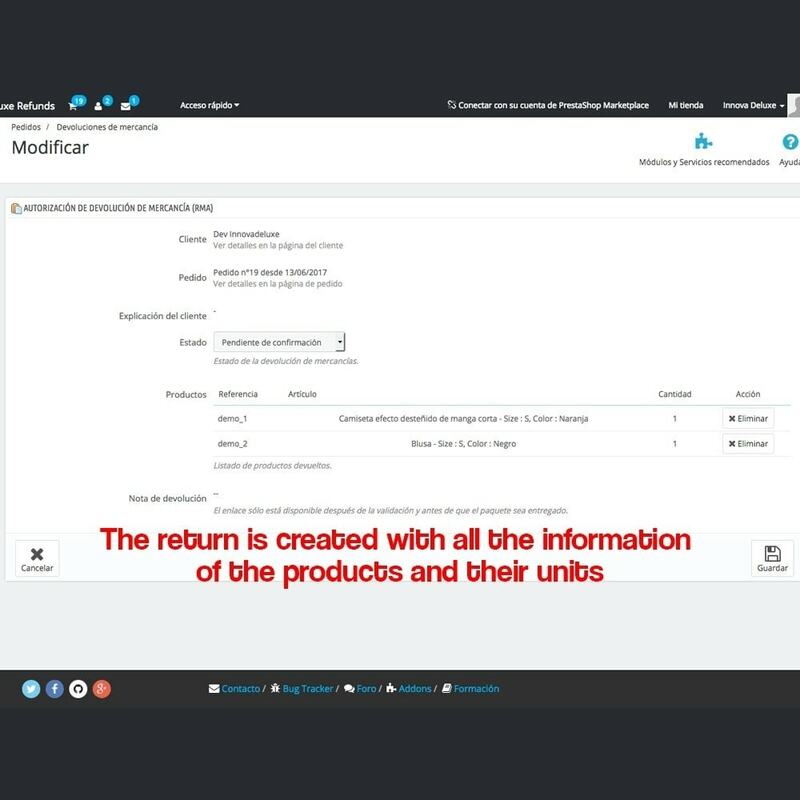 With this module you will accomplish with the consumer protection law or commerce law, providing a refunds form for your online store, asking your customers for the minimal information required in order to process a refund. Customers are not obligated to give any reasons for the withdraw. 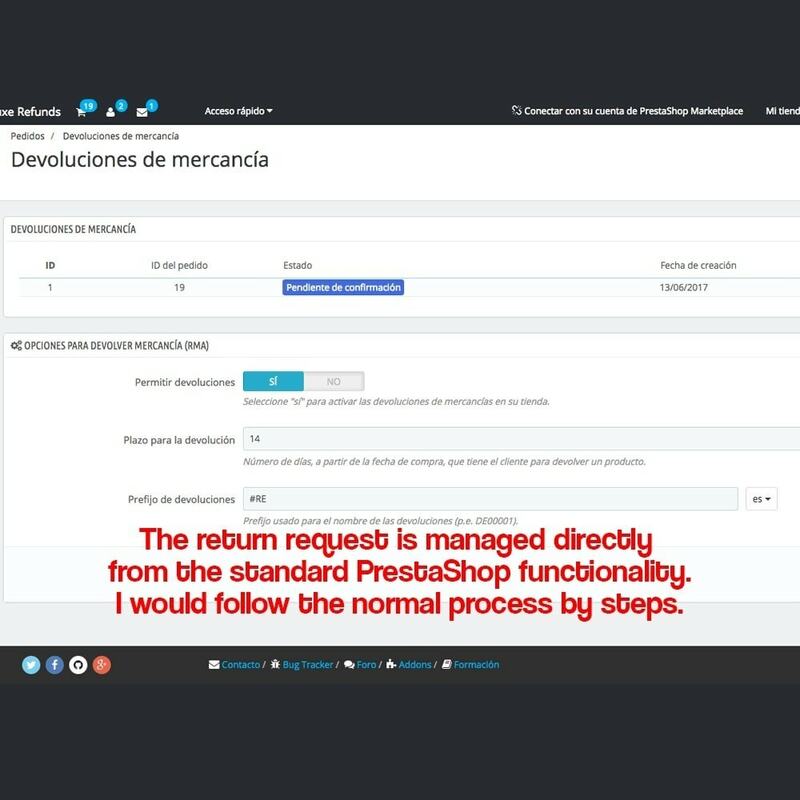 Although Prestashop is including in the orders history a refunds form, this one is not accomplishing with Spanish law and possibly neither with other countries law. The audits performed by “Confianza Online” over hundreds of Spanish online stores, the withdraw right uses to be one of the main points that any store is accomplishing, not providing a clear refund request method and obligating customers to give reasons why. 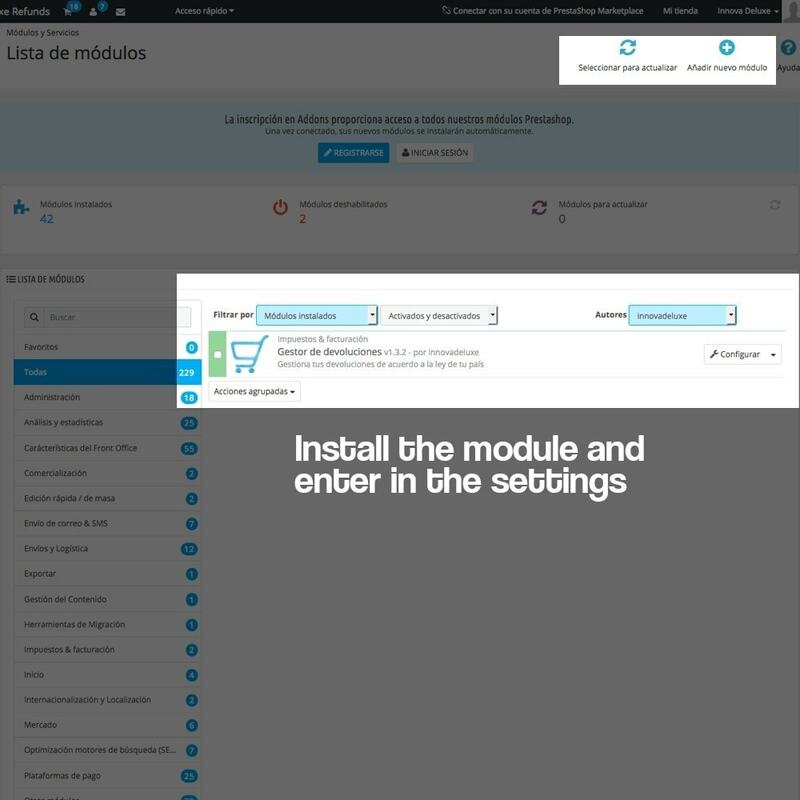 We as a “Confianza Online” official agent, has developed this module following the recommendations from “Confianza Online” for stores in order not only to accomplish law, also to accomplish with “Confianza Online” good commerce and transparency guides. What is customers “Right of withdrawal”? The main right for a customer who has purchased or hired services in the distance, (it means, without the possibility of testing them) is the right to see and test the product during a specific time period. During this period, the customer can change his opinion if the product is not accomplishing his requirements. Withdrawal is the consumer of a product right to withdraw it in a legal period, without giving no explanations or reasons why and not being punished for it. The right of withdrawal of a contract is the right of consumers and users to rescind the contract and shall inform the other party by the deadline for the exercise of this right, without having to justify its decision and without penalty of any kind. Clauses that impose on the consumer and user a penalty for the exercise of their right of withdrawal will be null and void. The consumer is entitled to cancel the contract in the cases provided by law or regulation and where so recognized in the offer, promotion or advertising in the contract. Meanwhile, the Trade Act provides for this right in the case of distance sales (those held without the simultaneous physical presence of the buyer and seller, especially by phone, catalog or internet) once those, and received the product or initiated the service for the consumer. The buyer shall have a minimum of fourteen calendar days to withdraw from the contract without penalty and without giving any reason. The right of withdrawal is not subject to any formality, being enough to be credited in any manner permitted by law. The right of withdrawal can not entail the imposition of a penalty, but the buyer may be required to take over the direct cost of returning the product to the seller. 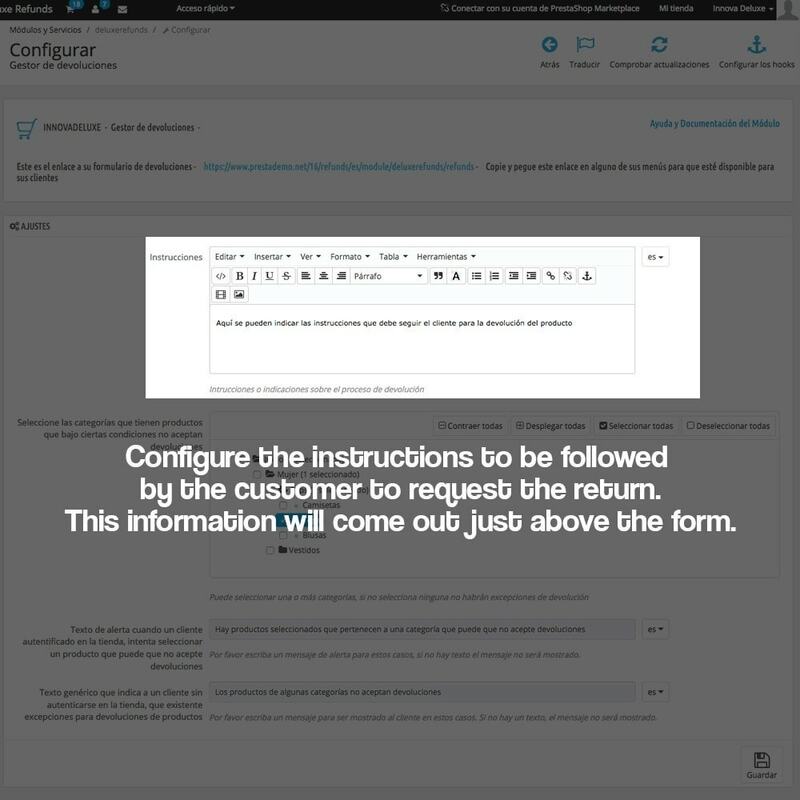 This module includes a form from which your customers can request their returns in a simple way. 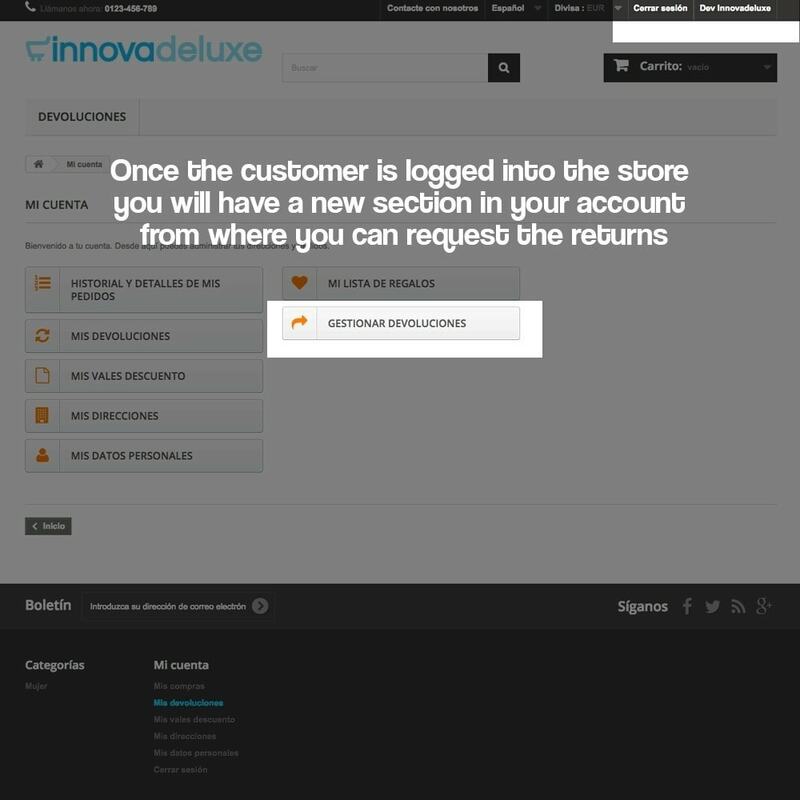 If the customer is logged in to the store, the form is auto-populated with the data required for the return extracted from its customer data. 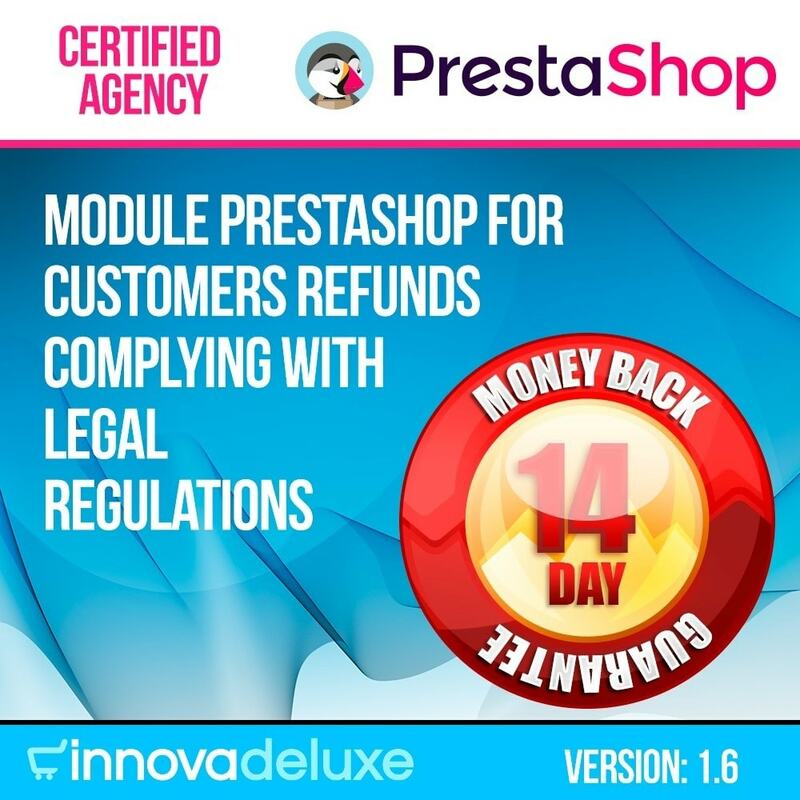 In addition, once the customer has logged on, this form will have a full integration with the system of return states that PrestaShop includes, respecting all the internal procedures of the store except for the initial request, in which it is not asked to Customer no reason to request a refund. The customer will only have to select the order, he will be shown the products and mark the ones he wants to return. 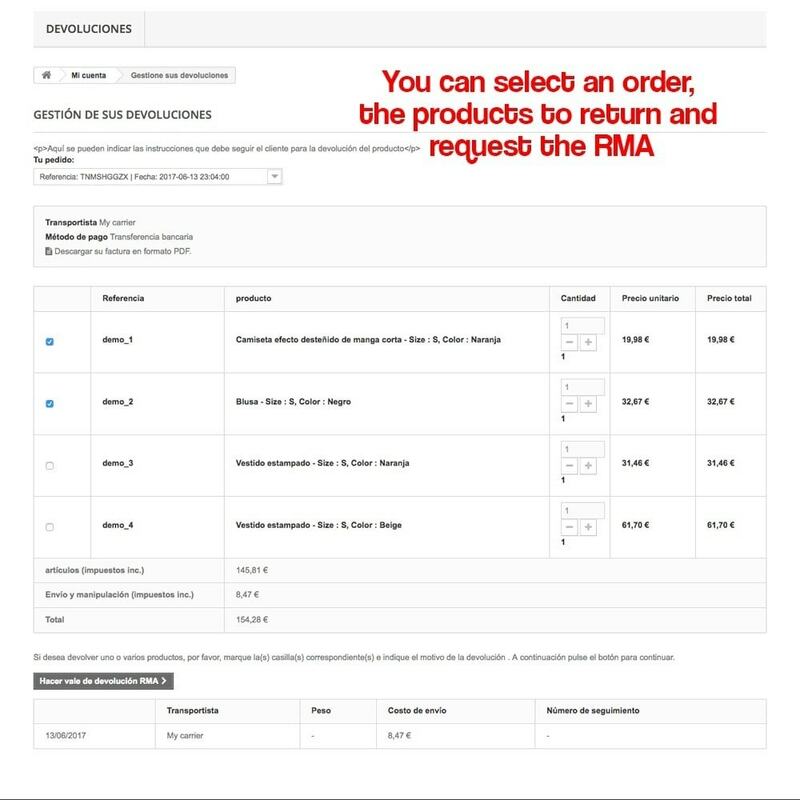 It is not necessary to return all the products of an order, you can return only the products that do not meet the expectations of the customer. 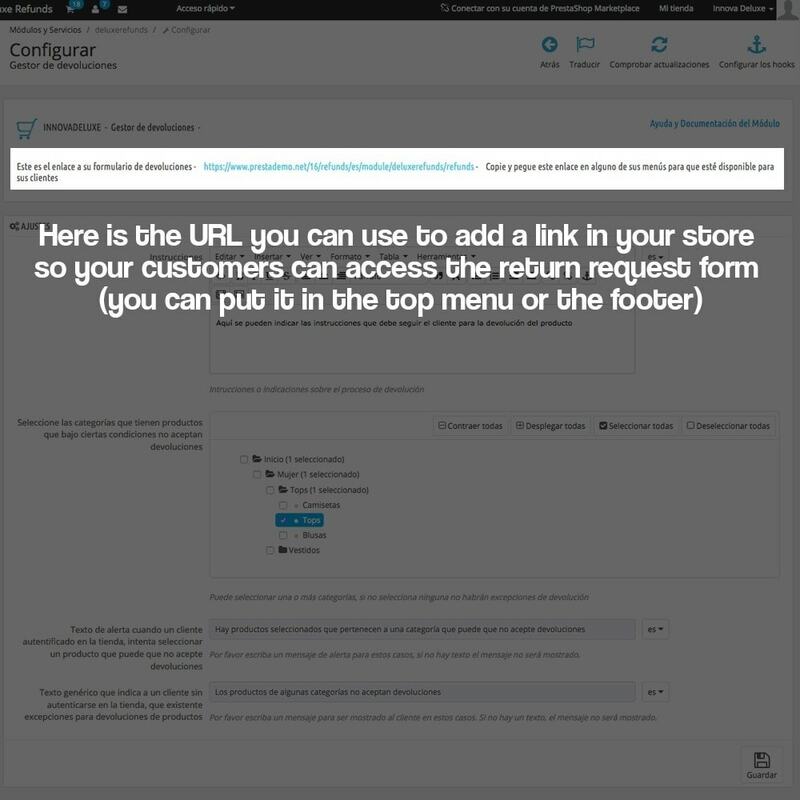 Once the customer has sent the return request, the form sends notification of this by email to both the store and the customer, registering the application in the customer system of PrestaShop. 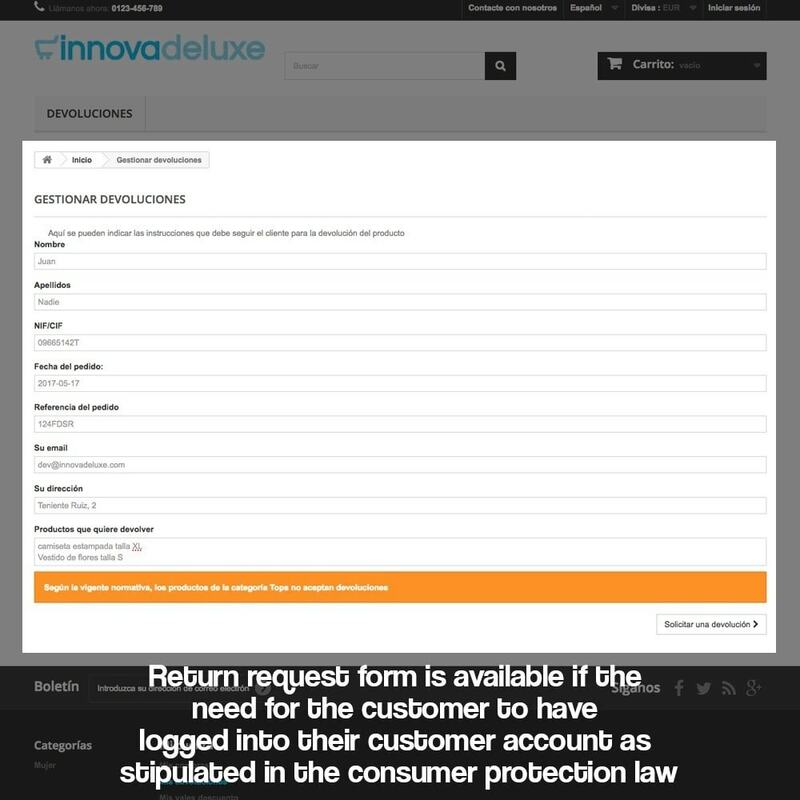 If the customer is not logged in to the store, a return form will also be available, as indicated in the Consumer Protection Law, which specifies that there must be a return form that is always available and accessible without having to start Sitting in the store. 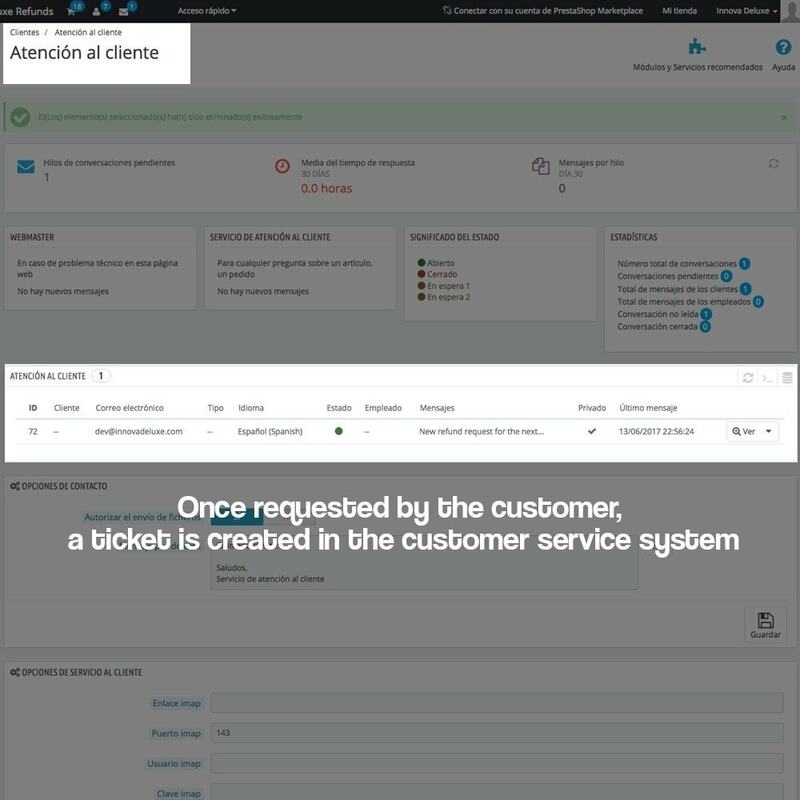 This form, is not integrated with the system and returns of PrestaShop, the request for return, is sent as a ticket to the customer service system of the store online. 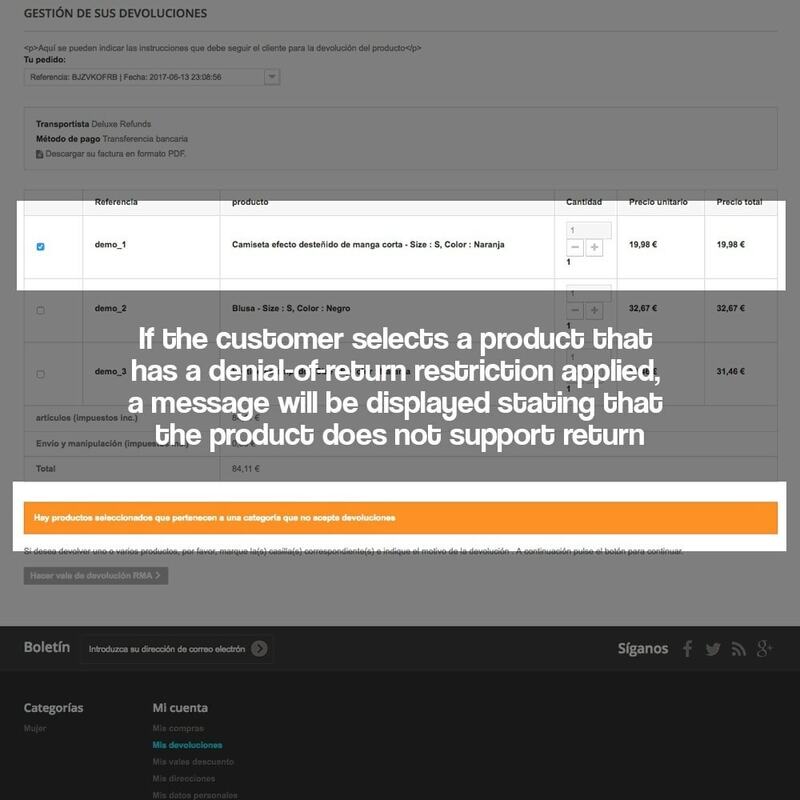 The module allows you to select categories for which the return of the product is denied. 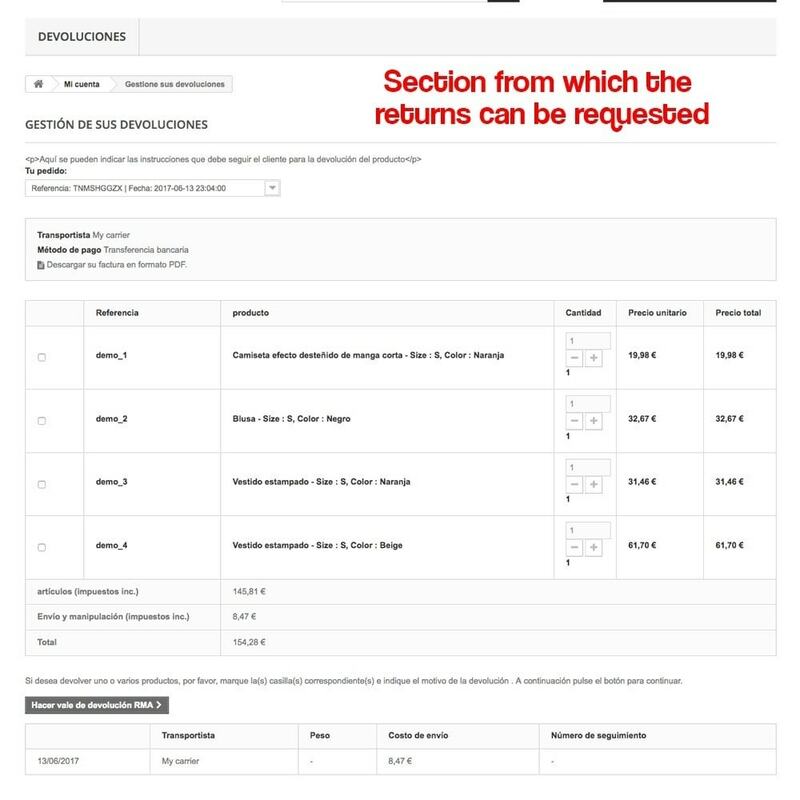 If a customer selects a product to request a return and belongs to one of the categories marked to deny, the module will display a message to the customer stating that that product does not accept returns. In addition you can customize the message that is shown to the client. New section in my account to manage refunds. New customer service thread for each refund request. Emails for shop and customers for each refund request. 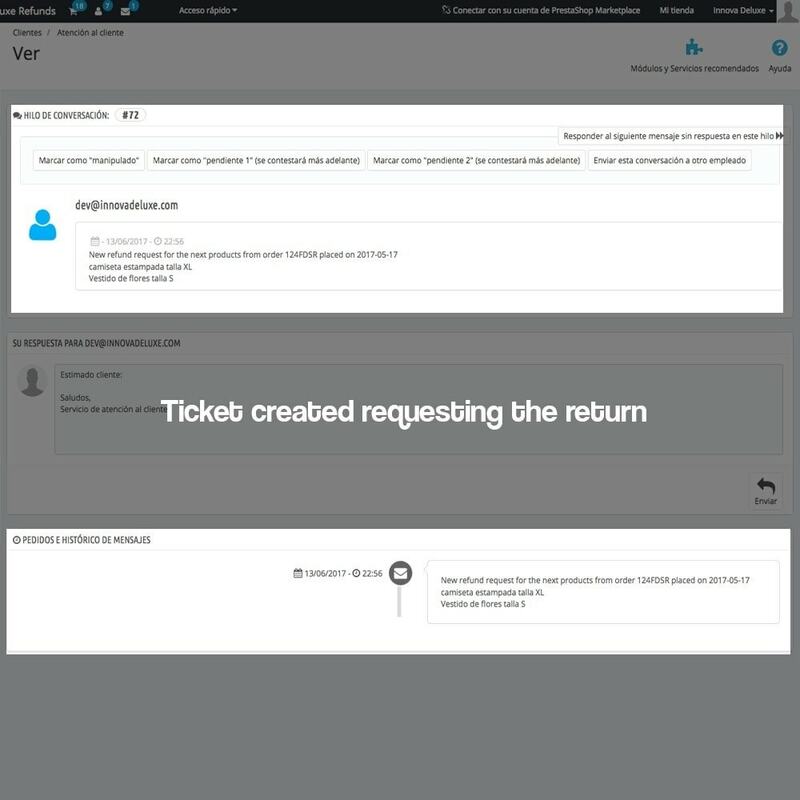 Custom HTML for instructions of advices about refunds. 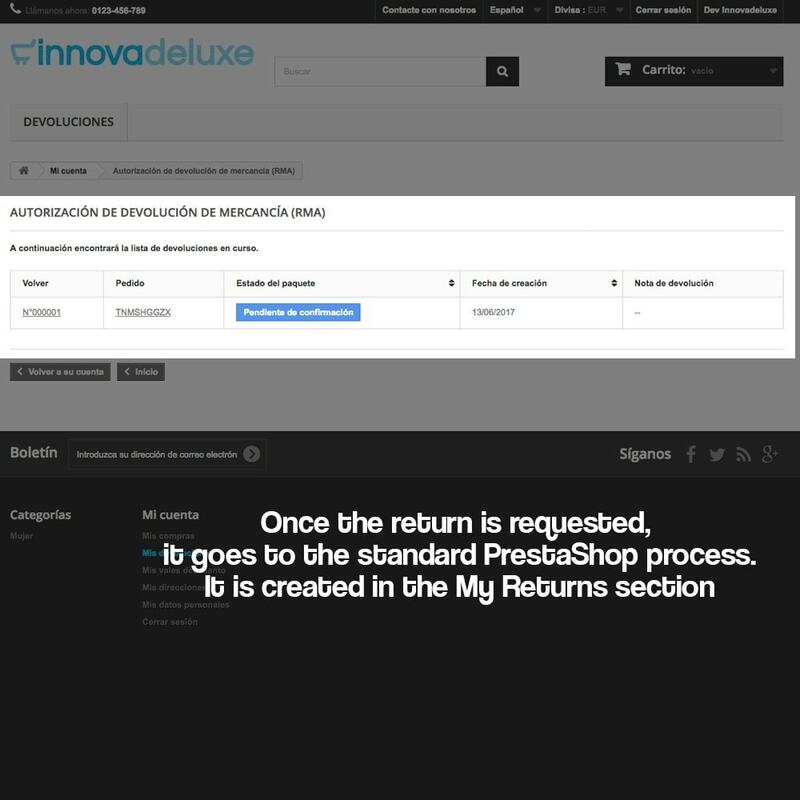 The customer will be able to ask for products refunds in a simple and fast way, without giving the reasons why he is requesting refunds. He will receive a copy of the request.